Why Do I Need An Author Website? Why Should WDR Design My Author Website? What makes a good WordPress theme for an author website? A theme is a group of files that dictates the look and feel of your entire author website. Because it controls every design aspect a visitor sees, it’s important to select your theme carefully. But there are hundreds upon hundreds of themes to choose from across the Web. For the less-than-tech-savvy author, deciding on the best one for an author website can be daunting…and a bit intimidating. How do you pick a WordPress theme that is eye-catching, memorable, and sure to impress readers, literary agents, and editors visiting your site? Writers have the unique task of finding a WordPress theme that’s capable of featuring large amounts of text in an aesthetically pleasing way. The fonts must be legible (no fancy handwritten fonts for body text, please). And if your audience skews to more mature readers, make sure the font is large enough to be easily read without zooming in or squinting. The colors should contrast but not clash. Black text on a white or light-colored background will be easier to read than the other way around, and glaringly bright colors should be avoided. You don’t want to give your visitors a migraine. Text lines shouldn’t run too long horizontally. Wide swaths of text can be hard to read, and you’ll lose engagement if a reader’s eyes have to travel too far left and right. Likewise, you should include several paragraph breaks—no one wants to read a giant block of text. There are many visually impressive WordPress themes, especially among those users have to pay for. 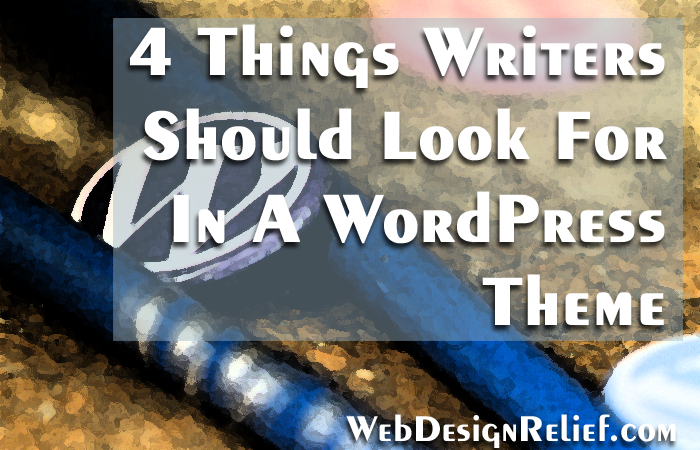 But the best-looking WordPress themes tend to also be the most popular—which means all the websites using them will look exactly the same. If your author website looks like dozens or even hundreds of other websites, it’ll be harder to make a lasting impression on your readers and potential fans. The easiest solution—short of having someone design something completely custom for you—is to find a WordPress theme that offers customization options that will allow you to create a personal brand and make it your own. This can be as simple as allowing you to upload a custom header image or to change the background and font colors. The more flexible your theme is in allowing you to insert your own personal branding into your author website, the more you can make it reflect your personality, writing style, and genre. Websites can occasionally be tricky and glitchy. WordPress itself is generally reliable. But when you’re dealing with a theme designed by a third-party developer who throws in extras like plugins and widgets, there’s always a chance something might go…ka-blooey. So it’s vital that you choose a theme by a developer who offers technical support. Most developers will have a contact form on their website so you can get in touch if problems arise. Larger companies often have support forums or ticket systems through which customers can request technical support and customization help. If a theme you’re considering doesn’t have a way to contact the developer for information or support, you’ll want to choose an alternative. A developer who is anonymous or appears to have fallen off the face of the Earth is probably not making regular updates to the theme. Eventually, the theme may become incompatible with future updates to WordPress, and you’ll be alone dealing with the resulting glitches and problems. As a writer, you will evolve and grow over time—and your author website should do the same. Over time, you may want to change the look of your website to match your latest book cover. Or perhaps you’ll need to add a sidebar with interactive widgets as your social media presence grows. Does your website theme allow you to add these updates without requiring a major overhaul? Just as your theme needs to provide a certain level of customizability, it should also allow you to expand your website offerings. Consider a WordPress theme with plenty of space for widgets you can add in the future, or consider one with a choice of several page layouts. That way, you’re never stuck with just one way of presenting your information. Need total control over your WordPress theme? If you feel comfortable dealing with the technical aspects of building an author website, consider using a framework such as Headway or Thesis to create what is essentially your own WordPress theme. These tools let you customize every aspect of your site: from the colors, to the fonts, to the page layouts themselves. However, these advanced theme frameworks are typically best left in the hands of someone with technical know-how. This may all seem overwhelming—but don’t worry! If you don’t pick the right theme at first, you can always change it later. And, of course, you can always avoid the problem entirely by leaving the hard work to someone with a lot more experience—Web Design Relief offers a variety of author Web design packages suited for every budget and every writer. QUESTION: What do you think is the most important element of a successful author website? As a proactive writer aware of current publishing industry trends, you know you need an author website. Careful research has convinced you that WordPress is the best online Web creation tool and content management system (CMS) available today. Now the next important step in designing your author website is deciding which plugins you are going to need to make it more functional. A WordPress plugin is a bit of software that gives additional functionality to a WordPress site. Some examples: an events calendar, a contact form, a social media widget. Since you might not know how to code these elements from scratch, using plugins is the way to go. Thousands of industrious developers around the world have already done the hard work of creating plugins that will meet your needs—all you have to do is “plug in” their code. Here are a few of the best WordPress plugins for creative writers. Jetpack lets you connect your self-hosted WordPress site with your WordPress.com account. This connection gives you the ability to see site statistics, edit website code, integrate social media, and more. With Gravity Forms, you can create custom forms for your author website: a contact form so your fans can drop you a line, sign-up forms for your mailing list, special polls, shopping carts, and more. Pro Tip: If all you want is a contact form, try Contact Form 7—it’s free! Social Media Widget creates a special widget that links out to all of your social media profiles. There are countless options available—from Facebook to Twitter to Pinterest, Instagram, YouTube, and more! The plugin offers different sets of coordinating icons that you can choose from, or you can install custom icons. “Pin It” makes it easy for visitors to pin and share your content. With the “Pin It” Button, every image on your site is accompanied by a Pin It button (upon hovering with the cursor) that will redirect the user to his/her own Pinterest account. Facebook Like Box shows off the number of Likes on your Facebook fan page and the faces of some of the people who Like you. It even lets new users Like your page without leaving your website! Check out our Like Box in our sidebar for an example of this great WordPress plugin! This helpful plugin will automatically backup your author website’s files and SQL databases to your Dropbox account. Regularly scheduled backups help minimize the stress and loss you would experience if something goes wrong with your website. All of your blog posts and core WordPress files will be safe and sound in your Dropbox account, ready to be reinstalled in the event of an author website emergency. Want your website to be more easily found on search engines? This amazing plugin allows you to see how SEO-friendly your copy is. Additionally, it supports social media integration and XML sitemap functionality. It’s a great way to boost your author website’s SEO. This helpful WordPress plugin makes it easy to showcase your upcoming events in a beautiful calendar that you can customize. Let all your visitors know when your next reading engagement is or where you’ll be signing copies of your book in the future. The Shareaholic plugin creates social share buttons that can appear above or below any post or page on your author website. With Shareaholic, visitors can share your site’s content on their social media profiles with ease, making it more likely that your content could go viral. What Else Do You Need To Know About WordPress Plugins For Writers? The most important thing to understand about plugins is that they are made by third-party developers (people who have nothing to do with WordPress), and so they may not always work as advertised. Whenever you’re considering a new plugin, first research the reviews on WordPress’s plugin directory and other forums to make sure it works properly and that its developers offer continuing support. Also, remember that WordPress is updated regularly, and some plugins are not—so you may encounter glitches, hitches, and problems with a plugin long after it has been installed. To get around this issue, consider working with a Web design company (like Web Design Relief) that offers hosting care packages—as opposed to a hosting plan that leaves you on your own. QUESTION: Which of the nine WordPress plugins that we list do you think could be the most helpful for you as an author? Are there any you use that we didn’t mention? Marketing savvy writers—and even authors who are marketing newbies—know the importance of an author platform. It’s easy enough to get all the necessary parts: An author website? Check. One or more social media profiles? Check. But simply having these integral pieces isn’t enough to ensure success: You need to be certain that everything works together like a well-oiled machine. How? Think of your online author platform as a car engine. Engines are made up of many parts that, when properly connected and fueled up, function in tandem to move the car forward. 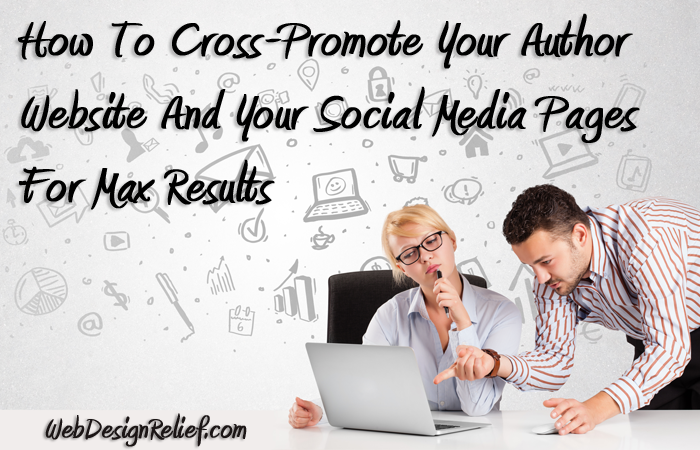 Your online author platform should work the same way. Otherwise, your author brand will be fragmented, clunky, and may stall. But with a bit of careful planning, you can interlock your author website and social media accounts so that all your promotional efforts perform with extra vrooom! Most writers simply include links to their social media accounts on their author websites, then link to their websites from the bio section of their social media profiles. However, this very basic interlink may not be enough to get visitors clicking. First, motivate your website visitors to forge stronger connections by making sure your Facebook and Twitter social media icons are prominently placed. Then, when you’re posting on social media, regularly include links back to your site. This will keep your followers up to date on your latest news, book releases, and blog posts—and also drive traffic across your platform on a consistent basis. Bonus tip: Most blogging platforms, like WordPress, let you connect your social networks to your blog. Your new blog posts will automatically be sent to your social networks! Promote your new book by hosting a contest. You can create a blog post that explains how to enter and encourages readers to help you promote the contest and your site overall. For example, visitors who wish to participate in the contest might be asked to tweet a link to your blog post on Twitter using a particular hashtag, then comment on the blog post with a link to the tweet. Or you could request that contest entrants pin a few of your previous blog posts on Pinterest and then comment with links to those pins. By linking to the contest rules on your social networks, you’ll bring existing followers back into your site. You’ll also benefit from more people commenting on your blog in general. In addition, anyone who entered the contest will return to your blog or social media accounts multiple times to check for your announcement of the winner. Most importantly, when contest participants enter by tweeting the link to your blog post, their tweet will be seen by all of their followers. This new audience will be drawn to your website, and may even enter the contest themselves and tweet about it to their followers, thus expanding your reach exponentially. Of course, you’re not just limited to social media—there are many more parts that you can use to power your promotion engine. Maintaining a mailing list and encouraging readers to subscribe will help extend your reach beyond the Internet browser and right into visitors’ inboxes. And don’t underestimate the usefulness of that traditional standby—a business card prominently featuring your author website URL. Remember, the whole point of having an online presence is to get your name out there and to make it easy for folks searching the Internet to find you and your writing. And if you’re not sure how to set up or maintain any of these social media or website elements, don’t sweat it. We offer several awesome Web design packages and can build you a great author website, which is the foundation of your whole platform! And with our Virtual Assistant Program, we can create and maintain your Facebook, Twitter, and Pinterest accounts—any one or all three! Give us a shout! QUESTION: What makes you want to follow an author on social media AND on the author’s website? Sign up to receive our FREE four-part series, The Writer’s Essential Guide To Reputation-Building In A Digital World—the ultimate resource for building your online author platform. YES! Send Me My FREE Guide!